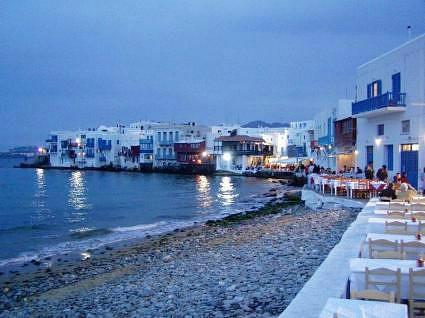 Mykonos Island is the playground of Greece with the postcard view: white little houses with flowers and blue trimmed windows and doors, hand painted walking streets, windmills, pigeon keepers, chimneys, lots of little churches and wonderful restaurants and cafes. According to mythology, Mykonos was where Heracles killed the giants with their corpses becoming the many rocks around the island. Many of the Greek “jetsetters” either have a house here or visit every summer, and the nightlife is quite active; frequented by the rich and famous. In fact, night life continues until the wee hours of the morning, and in some instances until the new sun rises. This island does not provide much for those on a budget, so be prepared to open your wallet. Chora: The town Chora, is the main town on the island and is a place you should really explore. 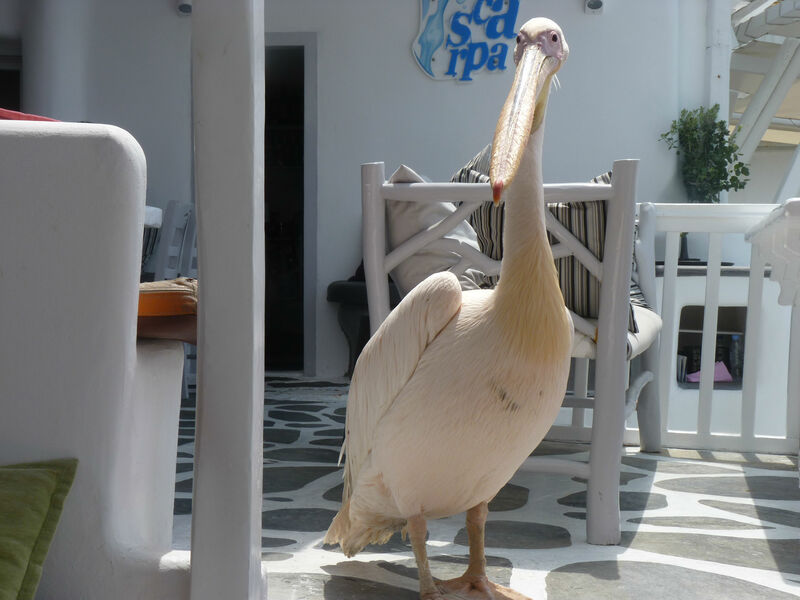 Walk around, go to the windmills, feed the mascot pelican Petros, have a drink in the little harbor and visit the Parapotiani church. And of course, go shopping. There are five museums in Chora: an archaeological, a laographic, a maritime, a cultural and a private museum with old rooms and furniture. Folklore shops are everywhere, and a great souvenir is a copy of the ancient Cycladic ideology; little white figures in various positions (playing the flute, praying, thinking, families etc.) fashioned after artifacts that have been found that are more than 6000 years old. For those interested in architecture, the built town of Chora is one of the best examples of the unique white box style with blue painted trim, a specific style of the Cycladic Islands. Within the town are a maze of little streets and walking paths that wind throughout, providing endless opportunities to explore, as you never know where you will end. 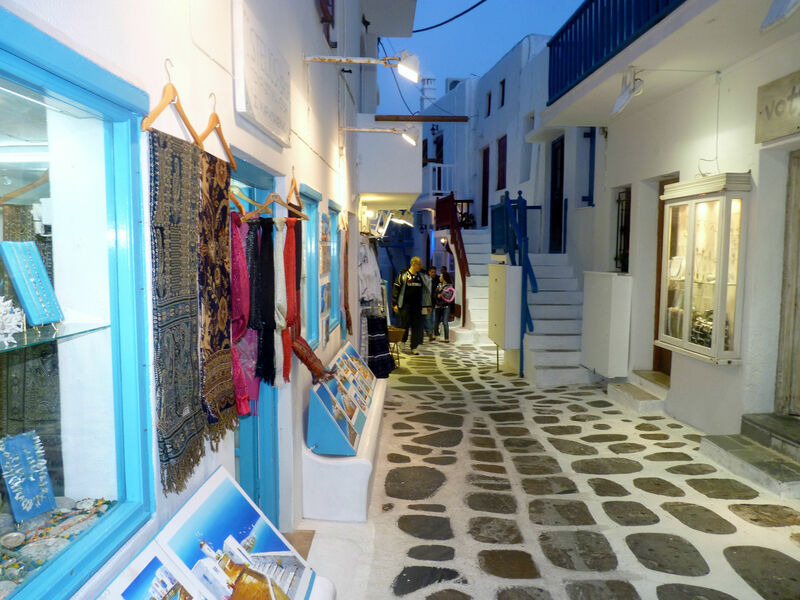 On the way, you might pass a store of couture, next to a store selling the Mykonos espadrilles, next to an artist’s gallery, next to a restaurant; as all is intermixed in a busy city center. 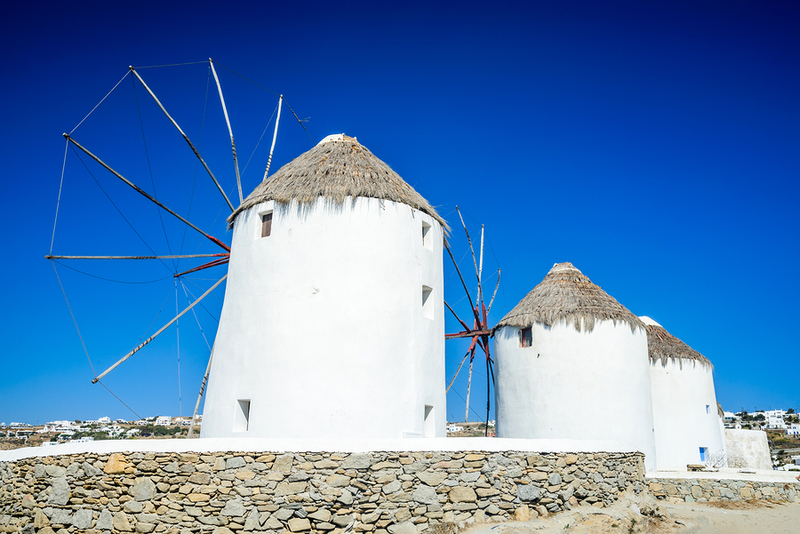 Just outside Chora are the famous and often photographed Windmills of Mykonos, which are another trait of the Cycladic Islands, the windiest island chain in Greece. Delos: A small island which used to be the holiest island in ancient Greece is easily accessed from Mykonos. No one can spend the night on this sacred island, but a visit is a must: the island is cluttered with archaeological remains. Once felt to be the birthplace of Apollo, Delos has been an important sacred island and an important island of commerce in a history that stretches back 5000 years. Your private crewed charter yacht can anchor right off the island of Delos and take you ashore with the ship’s tender. While the ruins are all marked, you may want to hire a guide for a more thorough tour, as the ruins on this sacred island are certainly some of the most famous. There is also a museum on the island housing various smaller artifacts found, many from everyday life. The museum also houses some of the more delicate statues and art found, including wall murals from various homes. Tenos: A neighboring island, Tenos, is the holiest island of modern Greece. The church of the Virgin Mary is a goal for thousands of orthodox pilgrims every year. It is also a very beautiful place worth visiting. Beaches: Around the rest of the island are many beaches, including Paradise Beach, the daytime party location for the chic. Walk between Paradise Beach and Psarou Beach on land, while your yacht follows behind by sea. The numerous beaches head up the many anchorages sprinkled around the coast of Mykonos, offering great spots for anchoring, swimming and enjoying lunch on board. Include Mykonos Island in a crewed yacht charter itinerary for the beauty of the island, the shopping, the nightlife, the beaches, and spend at least one night enjoying all that Mykonos has to offer.